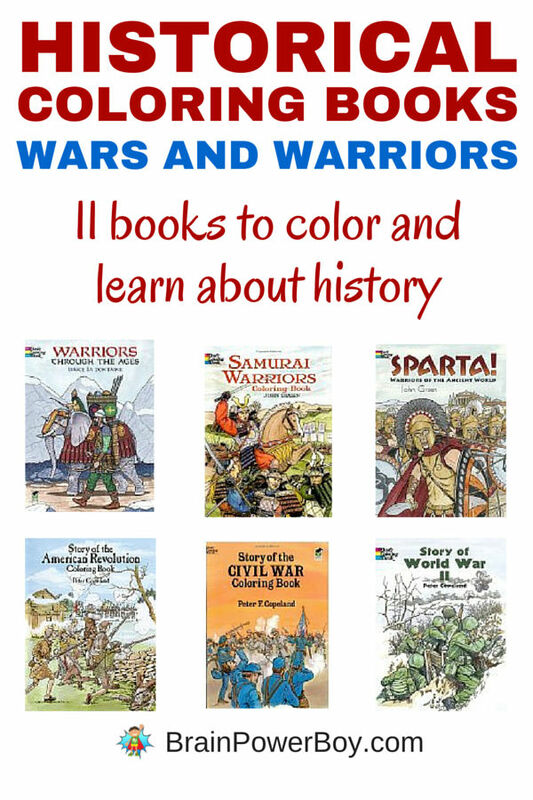 These Wars and Warriors Historical Coloring Books are a neat way to learn about history while relaxing and coloring. The warriors series includes warriors from Sparta, to Samurai to WWII. While the wars series covers the Revolutionary War, the Civil War, WWI, and WWII. There are plenty of books to keep a history buff happy and learning a lot about wars and warriors. Although these are coloring books, I am adding them to our best books for boys list because of the historical content contained in the books. Pick up a few of these wonderful wars and warriors historical coloring books. They are a great way to get a bit of history learning into your day. Warriors Through the Ages covers soldiers in history from the ancient warrior to World War II. There are 22 pairs of opposing warriors on facing pages, e.g. a Roman Imperial legionary opposite a Carthaginian warrior. This is an interesting and engaging format. Samurai Warriors Learn about the legendary samurai warrior class, see training practices, armor and weapons, and battles. Sparta! : Warriors of the Ancient World Shows Sparta’s military training, festivals, worship, and everyday life. Also includes famous battles. Heroes and Heroines of the American Revolution Nathan Hale, Margaret Corbin, Crispus Attucks, Molly Pitcher, Thomas Jefferson, Paul Revere, and others. The Story of World War I This history coloring book covers the history of “the war to end all wars.” Battles, machine guns, weaponry as well as famous figures and historical events. Story of World War II with its Japanese attack on Pearl Harbor, Stalingrad, Allied invasion of France, dropping of the atomic bomb over Hiroshima, the battles of Iwo Jima and Nagasaki, the fall of Berlin, is a good one to get. Story of the Civil War covers slavery, black leaders, Fort Sumter, a naval battles, the signing of the Emancipation Proclamation, Gettysburg, the assassination of Lincoln etc. From Antietam to Gettysburg The great battles and generals are included. The Union Army retreat and more in 45 scenes. Civil War Uniforms Coloring Book Find out exactly what the soldiers from the North and from the South wore during the Civil War. Color their uniforms and see their weapons. All 45 uniforms are shown in full color for reference. A Soldier’s Life in the Civil War Well-researched coloring book dramatically captures the danger, hardships, tedium, and lighter moments in the life of a Civil War soldier. 45 realistically rendered illustrations depict new recruits saying good-bye to loved ones, trying on uniforms, spending a relaxed evening in camp, posing for a photographer, facing a cavalry attack, and much more.